Election Officials Tackle Confusing Voter ID Laws In North Carolina Voters have to deal with some confusing new voter laws, including photo ID requirements. Election officials and voter advocates are trying to get the word out to avoid problems at the polls. A sign directs voters to a polling place during the Super Tuesday primary voting at a polling place in Arlington, Va. Early voting began this week in North Carolina for the March 15 primary. 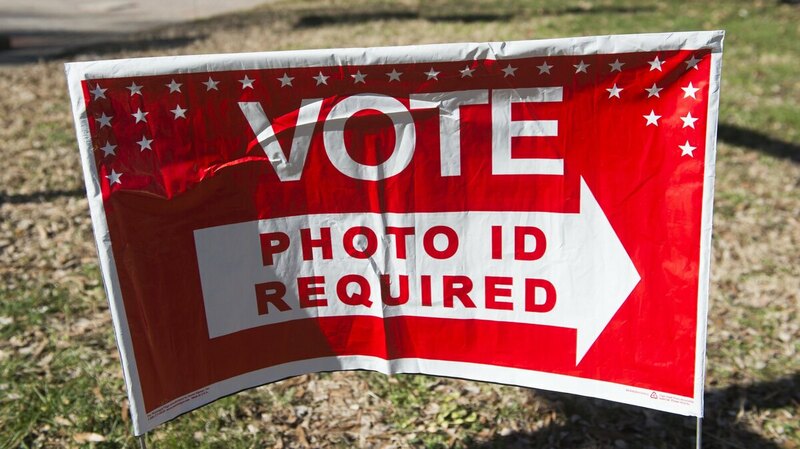 And for the first time, most voters in the state have to show a government-issued photo ID at the polls. It's one of several states with new voting laws this year. But in North Carolina, the rules have changed so much that confusion could be a voter's biggest hurdle. Across the state, election officials, voter advocacy groups and others have been trying to make sure things go smoothly, despite the changes. At the Unitarian Church in Rocky Mount, two dozen volunteers showed up on a recent Monday night to be trained as poll watchers, to help voters who might run into problems. It's part of an effort by Democracy North Carolina, an advocacy group that has opposed the ID law and other voting changes. Executive Director Bob Hall says the group hopes to have 800 volunteers trained to monitor polling sites during this year's primary. "This is the first election when all the complexities of the ID are in full force, and it's a very complex law," he told the Rocky Mount group. "And what you are going to do is help document what happens when the voters go in and try to vote. Are there problems? What kind of problems?" Hall says election workers not only have to determine whether an individual's ID is valid, they have to decide whether the photo on the ID bears a "reasonable resemblance" to the voter. He also noted that there are other areas of potential confusion, which could lead to voters being disenfranchised. For example, the state passed a law banning same day voter registration and the counting of ballots cast in the wrong precinct, but because of a legal challenge, those provisions are suspended for this primary. The state also decided last summer that voters who don't have the right ID can still vote if they declare they have a "reasonable impediment" to getting one, like a lack of transportation. "Is that what they're saying? They're going to do that? I hadn't heard about that. That's good," says Georgia Grant, president of the local chapter of the League of Women Voters, after she heard about the change. Grant says she's worried about how little people know about what is and isn't allowed at the polling place. She's been registering high school seniors and is surprised how many don't have an ID because they don't drive, and don't know that they need an ID to vote. State officials say they've been trying to get the word out about the new laws, and how those who need an ID can get one. They've aired radio and TV ads, held community meetings and trained county election workers. They've also encouraged counties to have "greeters" to meet voters on line before they check in to answer questions and make sure voters have everything they need. Ted Fitzgerald leads the state voter outreach effort and says the goal is to make sure that no valid voter is turned away. "We want to make sure that everybody's got the right information, the same information," he says. John Kearney, director of elections for Nash County, where Rocky Mount is located, says his poll workers are well prepared, but they're also human. "What people have to understand is they need to be patient with the poll workers. These are people that may be getting paid, but they're basically volunteers who do this once or twice a year or may have never done this. And we 're giving them stacks and stacks of information to understand and to process these voters," he says. Kearney thinks things will go smoothly, but says, to be honest, until voters show up, you never really know. One of the county's three early voting sites is at the Word Tabernacle Church in Rocky Mount, where the congregation takes voting very seriously. Many congregants say they're confident they'll have no problems at the polls, but some do worry that elderly voters who don't have the right ID will need extra help. Robert Slade thinks his sister-in-law is one of them. "She up in her 80s. But she go to vote every year," says Slade. "But she might get there this year and they turn her around." If all goes according to plan, that's not supposed to happen.